I have been on a Spanish kick as of late. España that is. Stoner put a Spanish wine section on the list at work, so I figured I better learn something about something. Bought a book, started a journal. I've brought home two from our list and he gave me 1/2 a sample bottle he popped open last night. Clos de Noi, it's 100% samso (a local name for carignane), and having been open for 24 hours it's super soft and I really like it. This is my last lesson, those Evas look way too good, I need something more. But I picked up some tins and I wanted to pay some dues, try the norms, so I gotta pop em open. Right? So with this fine Spaniard I will consume. Well that's interesting, a Product of Morocco, just oil and salt. Having not even tried them I know what to expect, safe, sane, cracker size, Trader Joe's Cracker Size. Sometimes it's just food. A lot denser that I thought, hardly fishy, so tuna like, these would be great to carry on long ride, with one of those tiny Tabascos. I don't know how much they cost. Trader Joe's, huh? They go so fast. Just four big bites there. I'm going three out of five tins, you know like a C, average but better than I thought, no bonus tin for packaging though, boring box. You know what, I'm going back to the pantry, I didn't even get crackers out yet, did grab the Tampico heat. How about some Brunswick In Spring Water, no Salt added, from BumbleBee. Just sardines and water. Product of Canada. This time I'll get civilized. Mr A23, preps very well for his dining experience, I'm home alone eating TJ's out the can. they should almost get a bonus tin just cause they are the perfect bicycle food, open it up, drain it off, firm, skinless, and good, easy to eat. These Brunswicks would not fare as well on the ride. Kinda messy. Toasted up some mini pitas. A bit mushy, not great flavor. Man, here is the lesson, no salt in water. I'm done with these, wish I had a cat. Two out of five tins, edible, but I'm passing, I'm going to save them, open two more cans, try them, save them, then tomorrow, I'll take them all add mayo, a little jalapeno, and make a sardine sandwich. Two from Natural Sea. Both in water, both contain vinegar, one with salt, one without. 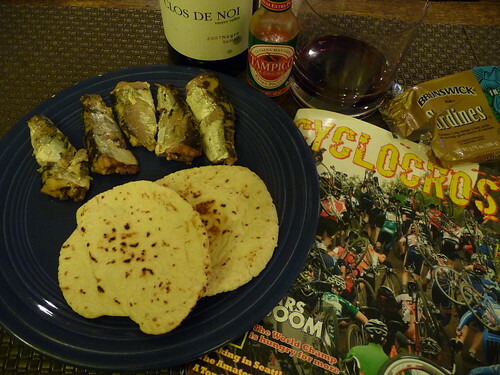 Brisling Sardines. 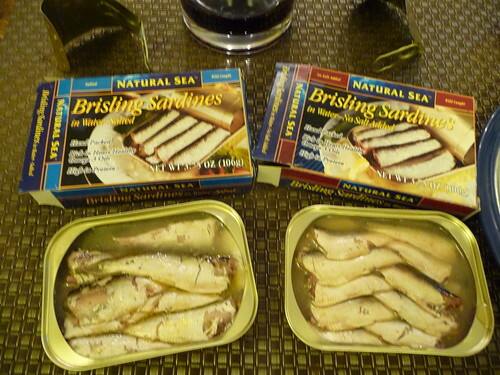 Brisling sardines are evidently, a smaller variety of fish. Salt is important. These have a little tail to them, really look like little sardines, delicate, mild, tiny. Without Salt are boring. With Salt are pretty good. These are the politically correct, wild caught, sustainably harvested, Product of Poland. $3.50/. I think I'm partial to oil. With Salt three out of five tins. Without Salt two out of five tins. Alright, I have stood on the porch, learned, consumed. Tomorrow I'm going out and getting something more interesting, more challenging. Thanks for playing, I got to go cook up my Buffalo rib eye I also brought home from work. Grass fed from South Dakota. Did I mention my wife's out for the night. Oh, and TJ is getting four out of five tins, I'm stocking up for rides. 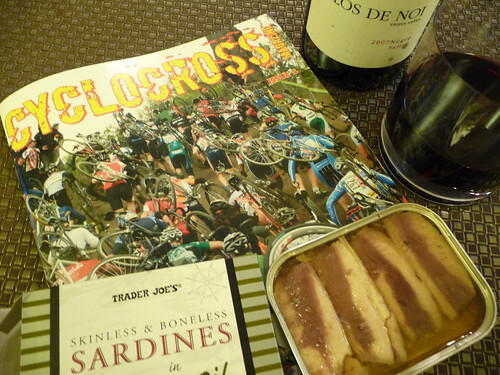 Though I am morally opposed to "skinless/boneless" sardines, I have eaten those TJ's ones at least a dozen times. They are a bit bland, but like you say, sometimes it's just food. I can totally see scarfing these down while in bonk mode on the side of a road somewhere. It just occurs to me that jersey pockets were probably originally made to fit tinned fish. Just a theory, but..